liquivid Video Improve 2.3.2 – Easy-to-use video and photo correction. liquivid Video Improve (was liquivid) is an intuitive, easy-to-use editor for your videos and photos. Clean up and improve all your captures with a single click, and have more fun viewing and sharing your memories. liquivid fixes lens distortion caused by wide angle lenses (as in most action-cams), removes camera shake and image noise, and improves colors and sharpness. Basic video cutting, batch processing, and support for all common video formats, codecs, and resolutions make it the tool-of-choice for everyone who wants to get more out of their captures. Stabilization Optically stabilize your videos, ideal for hand-held footage and action camera clips. Effects Visual effects give your photos and videos and special look & feel. Defish / Remove Lens Distortion Remove fish-eye effect from videos and photos (defishing), as caused by action cameras and other wide angle lenses. Comes with a series of built-in camera profiles and you can easily create profiles for any camera and lens you use. Built-in profiles currently include: GoPro Hero 3, GoPro Hero 3+, GoPro Hero 4, Sony HDR-AS100V, Drift HD Ghost, SJCAM SJ4000 and SJ 5000, DJI Phantom 3, Garmin VIRB, Rollei 6S, Rollei 410, GoPro Hero 4 Session, Mobius ActionCam (lenses A & C2), Parrot Bebop 2, Zoom Q8, Yi 4K. Denoise Remove noise from videos and photos, as caused by shooting in low light or with high ISO. Improve Contrast and Colors Improve contrast and saturation, making your videos and photos more vivid. Sharpen Improve sharpness, making your videos and photos look more crisp. Rotate and Crop Rotate videos and photos by 90 / 180 / 270 degrees or by arbitrary angles. Deflickering Remove flickering from timelapses and videos recorded under difficult lighting conditions. Change Play Speed Change your videos’ playback speed: Many actioncams can record video with 60fps or more. However, to achieve a slow-motion effect when watching your clips, you must first change the frame rate. liquivid allows you to slow down or speed up your videos. Add Text Add text to your photos and videos. Basic Video Cutting Export only those parts from your videos that you’re really interested in. 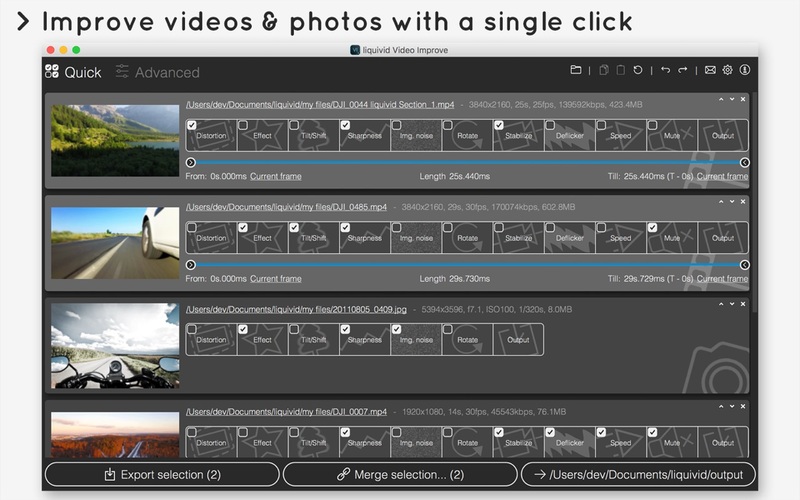 Merge multiple photos and videos into a single clip. Batch Processing Process all your files in one go with just a few clicks. Next story Cinema 4D R20 2.6.5.0095 – Create 3D videos and animation. Previous story WiFi Signal 4.1.1 – Monitor and troubleshoot the quality of your Wi-Fi connection. liquivid Video Deflickering 1.0.2 – Easy-to-use app that reduces or removes flickering from video. Playr 2.1.4 – Video playback simplified. liquivid Video Fisheye Removal 1.0.10 – Easy-to-use video and photo correction.